On their own, the bread and the cup, all of this food is only physical sustenance. they need a story and a blessing and a people who gather in humility to follow God’s commandment to love each other whole-heartedly. the betrayer and the beloved, the power-hungry and the justice seeker, the faithful and the fickle. then that table became a foretaste of love made real and of a world made whole. living into the promise of a more just, loving and hopeful future. we too will discover a foretaste of love made real and of a world made whole. 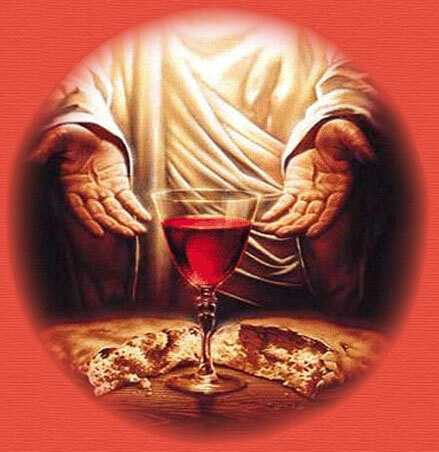 So let us eat together, as a new embodiment of that same meal shared by Jesus and his disciples long ago. 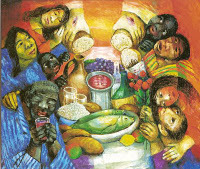 May the fellowship we share together be the blessing that makes this food the feast of God’s love, justice and hope. let us continue walking in the paths of humility, embodying the commandment to show love, to receive love, to be love to one another. May we be the bread broken that nourishes new life. May we be the cup poured out in intimate service to others. Giving thanks for God’s gifts of grace, the love that will not let us go, let us eat!